Thanks to Jeff Westbrook for providing simpsonsmath.com with the following summary, which we edited to remove spoilers: "Lisa and other kids on the Springfield Elementary Mathlympics Team compete against Waverly Hills Elementary... Springfield has a natural genius... who uses ancient techniques to compute geometric figures... [and] helps the Mathletes." Lisa is on a math team and the show features the "most complicated math jokes ever" according to Al Jean's twitter. Some of My Favorite Math Competitions, by Suzanne Lenhart, Association for Women in Mathematics Newsletter, Volume 45, Number 2, March-April 2015, pages 20-21, describes both individual and team-style competitions, including The Team Scramble, Moody's Mega Math Challenge, Math League, Rocket City Math League, and the National Log1 Contest. whose one varsity letter in high school was for Mathletes. Blood Feud [7F22] Legal Notice: The Simpsons TM and copyright Twentieth Century Fox and its related companies. This web site is for educational use only. To view these pages, you must agree to these terms. We do not benefit financially in any way from this web site. 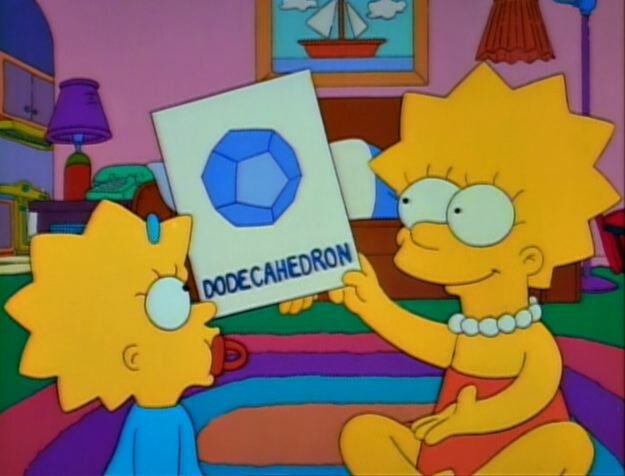 The images on these pages were taken from episodes of The Simpsons that are copyrighted by Twentieth Century Fox. We will not distribute audio, video or image files.